What does Ruiz signing with Phillies mean for Sox? 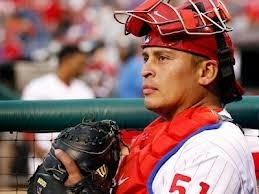 While the Boston Red Sox are still looking to sign a primary catcher the Philadelphia Phillies have filled their need at the position by re-signing Carlos Ruiz to a 3-year contract. Ruiz is currently 34 and will turn 35 in January. He signed a 3-year $26 million contract averaging $8.5 million for each of the next three seasons. This contract makes him the fourth highest paid catcher in the Major Leagues. Last year Ruiz played in only 92 games hitting .268 with 5 home runs and 37 RBI's. It now appears that the Red Sox are falling out of the race for signing a catcher at a price that they thought would be reasonable. It may appear that instead of Cherington may stop looking to sign a free agent and will instead look towards trading for a primary starting catcher. Look for an article later this week that will examine potential trades the Red Sox could look at to try and get a catcher. What do you think the Ruiz deal means for the Red Sox? Will Ben Cherington be able to swoop in at the last moment and sign a free agent catcher for a reasonable price or will he end up having to overpay or trade for a catcher? If we trade for a catcher who do you see fitting in with Boston? Leave your answers in the comments below or tell me on twitter. Make sure you check back later this week when I examine potential trades for a catcher.